The marriage of Lego toys with the Minecraft brand is just perfect, as both activities encourage creativity and endless play that's perfect for kids (and kids at heart). 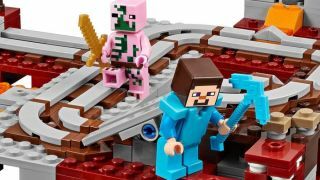 You might've already been aware that Lego and Minecraft had teamed up for a line of themed sets - but you might not realize just how intricate some of these sets can get, with some built from 1,100+ pieces. If your loved ones adore building intricate buildings or silly forts in Minecraft, these Lego sets would make a great gift that can be constructed, collapsed, and rebuilt time and again - and they've gotten some serious discounts during all the Black Friday game deals that give way to a Cyber Monday blitz. Best of all, each set comes with its very own Steve minifigure, so you roleplay the building process right.